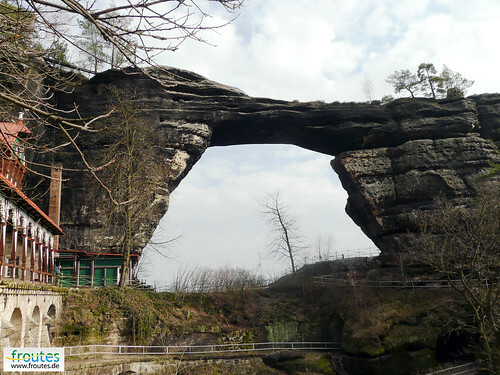 Pravčická Brána also known as Prebischtor (in German) is the largest natural stone bridge in Europe and possibly the second largest in the World, after Rainbow Bridge, Arizona. As per Wikipedia the Landscape Arch in Utah and also the Kolob Arch in Utah are generally termed as arches and not bridges as these do not connect high two land masses. 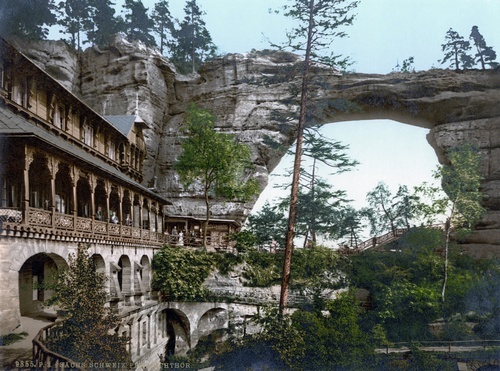 Unlike the desolate surrounding of the Rainbow Bridge and the arches in Utah, the Prebischtor is located in lush green mountainous and picturesque region in the north-western Czech Republic, known as Bohemian Switzerland (aka Czech Switzerland). The Sandstone bridge is located close to the town of Hřensko about 15 km north of the city of Decin. It has a span of 26.5 metes, width of about 7-8 metres, clear opening of 16 metres, and a minimum thickness of 3 metres. Due to the strong erosion visitor traffic over the rock bridge is not allowed since 1982. Adjacent to the bridge is a privately owned old holiday château built in 1881 and known as the Falcon's Nest. Its first floor houses a museum of the National Park and the ground floor contains a preserved, period restaurant decorated with original paintings.